The Australian National Botanic Gardens provide a fantastic habitat for many of Canberra’s birds, with water and nectar in abundance. It is marvellous to be in the Gardens early in the morning before they are open to the general public. During Floriade we offer an early morning walk at weekends. Join us for a 1½ hour guided walk to see many of the Gardens' amazing birds. This year we are not including breakfast, but you are welcome to purchase a coffee or breakfast following the bird walk in Pollen – the Gardens Café. It is a great time to come and observe the feeding and nesting behaviour of our birds and their young. Some binoculars will be provided, but bring your own if you have them. We can show you how to identify our most common black birds; magpies, currawongs and ravens, choughs and magpie larks and introduce you to some cockatoos, parrots and honeyeaters and the habitat where they are most commonly encountered in the Gardens. Wake Up With the Birds is on 7.45am each Saturday and Sunday 22 September to 14 October during Floriade, for people more than 8 years old. Cost for Friends of the ANBG is $12, and $15 for others. Wear comfortable footwear and warm clothes. 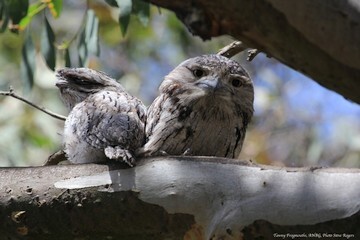 For more information or assistance email birds@friendsanbg.org.au or phone 0421 131 898 (phone operational after 24th August).